What can we say that others have not said about Ichiban Sai Gon in Boca Raton. We shared a truly remarkable dining experience: the food was brilliant, the airy dining room inviting and the service was always attentive without being intrusive. Despite the proliferation of chain eateries, contemporary chefs like proprietor Manny Rojas are branching out into boutique restaurants offering exquisite masterpieces that rival the very best that South Florida has to offer. After two decades of working at some of the most notable sushi kitchens in the city, Chef Rojas has created a unique Asian themed restaurant that features innovative and exciting signature creations. Think sushi, sashimi, and classic rolls but on a higher level that will challenge the very best the region has to offer This petite restaurant offers bigger than life flavors. The intimate light fillrd space futures an open kitchen fronted by a four seat bar. Contemporary prints and artifacts add a distinctive charm to the sparkling white interior. Happiness is the Chef’s Tuna Tower ($10.99) filled with satiny cuts of blue fin tuna, tangy avocado, touches of soothing assiago cream and premium caviar. All of the above sit on base of ethereal rice. A mesmerizing plate of Gyoza ($5.99) , divine dumpling filled with seasoned pork and vegetables, gets an extra lift from a superbly fashioned Ponzu sauce. It just doesn’t get better than these mouthwatering gems. With each superlative dish, you nay wish to add some hot, cold or plum sake. Domestic and imported beers are also a delightful option as is the selection of house wines. My Cavit Pinot Grigio ($7.50) was served at the proper temperature and was a constant companion throughout the evening Roll aficionados can feast on an almost infinite collection of Ichiban, Special or Classic treasures. (The Chef’s boundless imagination has even designed a U.S.1 Roll). The superbly displayed Florida Roll ($12.99) magically transforms yellow fin tuna, scallions, avocado and fish eggs into sublime rounds of joy. 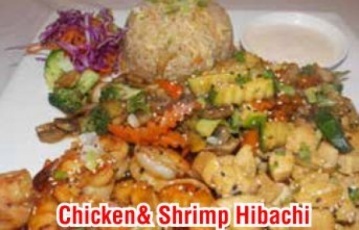 Harmonious and precise cooking is what makes the Chicken and Shrimp Hibachi ($16.99) so extraordinary. Tender morsels of savory filet and plump crustaceans are superbly grilled and partnered with a delectable assortment of crisp vegetables, The final course, Tempura Ice Cream ($5.50), was a bountiful, harmonious treat beautifully plated, filled with amazing flavors and textures that will leave you longing for another helping.